Elle Bennetts Joins the GIANTS Victorian netballer Elle Bennetts has been signed by the GIANTS as a rookie ahead of the 2018 AFLW season. Elle Bennetts will play for the GIANTS in 2018 after signing as an AFLW Rookie. She kicks on both sides of her body and is likely to play across half-back. We’re really excited to have her on our list. The GIANTS have signed Victorian netballer Elle Bennetts as a rookie ahead of today’s NAB AFL Women’s Rookie Draft. The Health and Physical Education Teacher at Star Of The Sea College in Brighton, was signed as a rookie under the provisions for players from other sports. “I’m so excited it’s such an amazing opportunity I can’t wait to get started and get out there,” she said. Become a GAINTS AFLW Supporter Member in 2018. Sign up or re-new today. 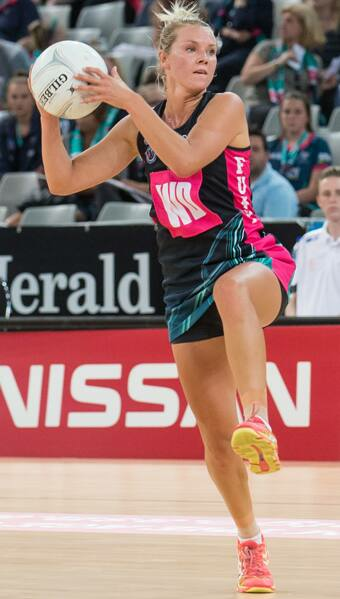 Bennetts played for the Victorian Fury in the Australian Netball League from 2012 to 2017 and is a four-time premiership player. She was vice-captain of the Fury this season playing in the mid-court. Bennetts attended the GIANTS’ AFLW testing day at the WestConnex Centre in September and impressed enough to be added to the club’s list for the 2018 season. AFLW Head Coach Alan McConnell said he was excited by Bennett’s talent. “Elle obviously comes from an elite netball background so we were able to select her as an alternative sport rookie,” he said. “She trialled here during our first trial day and excelled. She showed great poise and like a lot of dual-sport athletes, seems to have really good decision-making skills. Yesterday the GIANTS announced the signing of local Western Wolves forward Melissa Freckleton as a free agent. The duo join new GIANTS Jodie Hicks, Tanya Hetherington, Courtney Gum, Phoebe Monahan, Philippa Smyth and Cora Staunton who were all drafted on Wednesday. There are two spots remaining on the club’s list with the NAB AFL Women’s Rookie Draft to be held on Friday from 12pm. The GIANTS' AFLW team starts pre-season training on November 20.